Landscape features can influence animal movements and gene flow, so rigorous analysis of population structure should include both levels of analysis. We conducted individual-based landscape genetic analysis, using data from eight microsatellite loci, on adult female moose (Alces alces; n = 92) from two areas in southern Ontario, and also monitored movements of a subsample of animals (n = 38) to gauge complementarity of the data sources (genetic and telemetry data) in understanding patterns of population structure. Genetic data indicated that female moose constituted a single panmictic population encompassing both areas, with no evidence of isolation by Euclidean (Mantel test p > 0.38) or least-cost (Mantel test p > 0.19) distances, even when such distances were calculated from costs extracted from resource selection functions of the radio-collared individuals. In contrast, throughout the 2.5-year study radio-telemetry data failed to reveal large-scale movement of female moose. In fact, although moose tended to occupy home ranges in a wide range of sizes, their locations were largely fixed at a larger spatial scale encompassing both study areas. 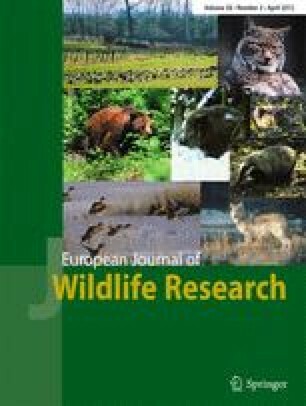 This finding implies that radio-telemetry data alone would not have revealed the extent of connectivity between moose populations, whereas least-cost genetic measures in the absence of telemetry data would not have shown the localised movements of adult females. Our contrasting results highlight the importance of multiple sources of information when assessing population connectivity of large mammals. We are grateful to the many staff and graduate students who helped conduct the study. The study was funded by the Strategic NSERC program, Ontario Ministry of Natural Resources, Ontario Parks, Canadian Foundation for Innovation, Trent University, Canada Research Chairs program, and Ontario Federation of Anglers and Hunters. We thank E. Reid, B. Steinberg, and J. Winter for their help with logistics and other support and K. Hussey and M. Hornseth for help with the preparation of this paper.